If your carpet is worn through in part : or if it has suffered a 163 burn, or a stain which is impossible to remove, consider making a carpet patch. For this reason, always keep any off-cuts or spare pieces when fitting a new carpet. If you do not have a suitable off-cut, take your patching material from a place which is usually hidden by furniture: e.g. under a sideboard or a settee. Loose-laid carpets or rugs can be repaired from the back. There is a special technique for making sure that the patch fits exactly. Lay the new piece over the face of the damaged area, making sure that the pile slopes in the same direction. Now cut through both layers around the damaged area with one cutting action, using a sharp knife. Smear latex adhesive around the inside of the hole and around the edges of the patch, to about half-way up the pile: leave this to dry until the thick white liquid has turned semi-transparent. Turn the carpet over and put the patch in from the back, then cut a piece of hessian slightly larger than the repaired area. Stick this over the underside of the patch, to hold it in place on the back of the carpet. Check that the edges are well stuck down, and then tap all over with a hammer for a really good bond. 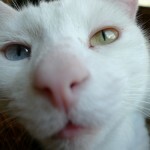 For fitted carpets, of course, you will have to work from the front. First cut your patch, as described for loose-laid carpets, above, and coat its edges with latex adhesive. Place on one side. Now cut a piece of thick paper larger than the patch and put it through and under the hole so that it lies flat on the floor or undertelt. Cut a piece of hessian a little smaller than the paper, but still slightly larger than the patch and push this through the hole so that it lies on top of the paper. Coat the hessian and inside edges of the hole with latex adhesive, and then insert the patch and tap around the edges with your hammer. Alternatively, you can use carpet seaming tape to fix the patch in place for fitted carpets. Cut the patch as already described. Cut four pieces of seaming tape slightly longer than the sides of the patch. Apply adhesive to one side of each piece and insert them through the hole to lie on top of the underlay or floor, forming a frame around the edges of the neatened hole, sticky sides up. Apply adhesive to the edges of the back of the patch, place it in the hole and tap around the edges with a hammer so that the two sticky surfaces bond together. Left: loose-laid carpers can best be patched from the back. First decide how much of the worn or stained area you wish to replace. Then lay your spare piece of carpet over the damaged area, taking care that both piles run in the same direction and, if possible, that any pattern matches. Can through them both with a sharp knife. Then smear latex adhesive around the inside of the hole and the edges of the patch, to halfway up the pile, and leave to dry until semi-transparent. Turn the carpet over and put the patch in from the back; cut a piece of hessiau to reinforce the patch, slightly larger than the repaired area. Stick in place with latex adhesive. 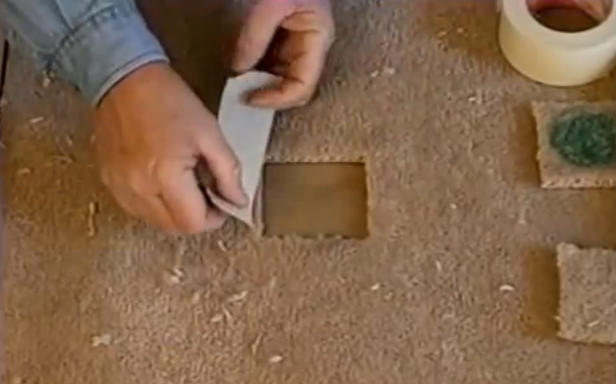 Alternatively, cut two pieces of carpet seaming tape and glue them into place from the back to reinforce patch. Fitted carpets, of course, must be patched from the front. Reinforce the back of the carpet as described in the text, opposite, then insert patch from the front as shown here Above: always keep spare tiles after completing any wall or flooring job. To replace a damaged ceramic floor tile, gently break up the damaged tile with a hammer and cold chisel, working from the centre, outwards. Wear safety goggles to protect your eyes from flying fragments. Pick out the pieces, prising them up with a chisel if necessary. Spread a new layer of ceramic floor tiling adhesive, then bed down new tile, making sure that it is the same level as the surrounding tiles. Scrape away any excess adhesive using a trowel Right: metal repair brackets come in various sizes in three basic shapes: right-angled, flat L-shaped and flat T-shaped. 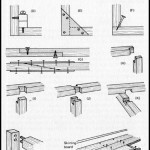 They can be used to repair a variety of wooden structures, including furniture, window frames and gates as possible from the edges. Cut tape to length and apply latex adhesive to half its width; then brush on adhesive to the same width on one side of the carpet. Wait until the adhesive is nearly dry and then press the tape down on to the carpet edge taking care to position it neatly without wrinkles. Turn the carpet over and repeat the technique on the other side. Finally tap down along both sides with a hammer to ensure good adhesion. Curling rug edges can sometimes be cured by coating the back with latex adhesive and allowing this to dry. Or you can try backing the rug with underfelt, stuck on with latex adhesive. If the curl is really persistent try backing that area with a thin piece of card. Foam underlay is available for rugs that creep on top of carpet, and rubberized netting can be bought to stop rugs from slipping on polished floors. When patching vinyl and lino, place spare piece over damaged area and cut through both layers to obtain a patch which is an exact fit. Fix patch to floor with heavy-duty double-sided adhesive tape. 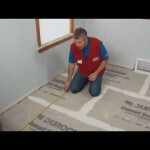 Clean the floor as well as you can before sticking down the tape, to get a good bond. Damaged ceramic and quarry tiles can be replaced provided you have a spare tile of the same design. Keep a few spare tiles after any new installation. Gently break up the damaged tile with a hammer, working from the centre outwards, and taking care not to damage surrounding tiles in the process. Pick out the pieces, prising them out with a chisel if necessary. Scrape away all the old adhesive, and stick down the new tile using the appropriate adhesive. Renew grout as necessary. You can also replace damaged cork and vinyl tiles, provided once again that you have a replacement to match. Ease away the damaged tile with a broad-bladed stripping knife: you may find that it helps first to heat the tile with a fan-heater or hairdryer to soften the adhesive. Scrape away as much of the old adhesive as you can. Then fix the new tile in place with the appropriate adhesive. If the problem is simply that the corners of the tiles are curling upwards, restick them, and weigh down until set.